Everyone loves some good waiver wire sleepers for fantasy football, and that's what we're here to talk about. The approaching week of NFL action is the start of the fantasy football playoffs for most leagues, so we will be recommending waiver wire sleepers to target for Week 14 and the playoffs. Some of these players may still be available in your leagues, and could be viable sleepers to pickup and start based on your league and team circumstances. Analysis: Edelman was a critical part of the Patriots offense earlier in the season, when the team was dealing with injuries to Gronk, Vereen and Amendola. As each player started returning to the lineup, Edelman's role decreased in the offense and his snaps/targets became very limited as the number 4 or 5 receiving option on the team. But in the past 2 weeks, the Patriots have been utilizing Edelman much more heavily, and he looks to be playing over Amendola. 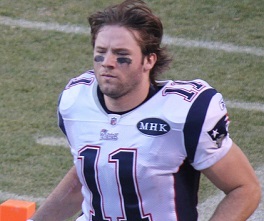 In Week 12, Edelman had a huge game with 11 targets, 9 receptions, 110 receiving yards and 2 touchdowns. And this past week, Edelman followed-up that performance with another gem, racking up 12 targets, 9 receptions, and 101 receiving yards. Although he is already owned in 53% of leagues, at this point Edelman must be owned in all leagues, as Tom Brady and the Patriots will be feeding him the pigskin next week and throughout the playoffs. In standard leagues he is a WR3 with upside, and in PPR leagues Edelman has re-emerged as a WR3/WR2 option with upside. This Julian Edelman snippet was also featured on FantasyPros.com's waiver wire article for Week 14. Analysis: Joe Flacco hasn't had an elite season by any means, but has been a solid fantasy football contributor throughout 2013 and has had a couple of solid games the past 2 weeks. This past week Flacco completed 24 of 35 pass attempts, for 251 passing yards and a touchdown. Flacco gets to play the lowly Minnesota Vikings in Week 14, who are giving up a ton of points to opposing QBs and offenses. Expect Flacco to pick apart the Minnesota secondary in Week 14, just in time for the fantasy football playoffs and your fantasy teams. If you play in a 2 QB league where Flacco is still available, have a tough matchup with your QB next week, or are just hurting at the QB position - target Flacco as a waiver wire sleeper for Week 14. Although he is already 52% owned in Yahoo leagues, a QB of his caliber and with his upside shouldn't be sitting on half of the fantasy waiver wires heading into the playoffs and a matchup with the Vikings. 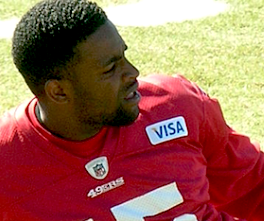 Analysis: After a long-awaited return from an achilles injury, Crabtree finally made it back onto the football field for last week's game against the St. Louis Rams. He immediately resumed an important role for the San Francisco offense, and wide receivers, as he functioned as the primary WR option for Kaepernick. Crabtree played a healthy 42 snaps (out of 67), compared to just 16 snaps for Mario Manningham, and hauled in 2 catches for 68 yards (good for 8.8 points in PPR leagues). Crabtree's playing time, snaps, targets and receptions should all continue to increase over the next few weeks, making him a waiver wire sleeper to target even with a tough matchup against Seattle next week. Although Crabtree is already 47% owned, if he's still available in your league pick him up immediately and stash him for the playoffs. There aren't many WRs available, if any, with this much sleeper upside that are still widely available on the waiver wire. Analysis: All season long we have been waiting for the Minnesota Vikings to take the training wheels off of their talented young rookie wide receiver, and over the past few weeks they've finally started to do so. After having very limited playing time for most of the season, Patterson has seen his snap count increase over the past few weeks. This increase resulted in an 8 catch performance two weeks ago, where has saw 11 total targets, good for 13.40 points in PPR leagues. That performance came a week after he saw 9 targets, and this past week Patterson put up 10.10 points in PPR leagues as he scored a touchdown on a running play and hauled in another catch. While him playing 54% of the snaps this week is a bit low for our liking, we anticipate the Vikings will continue to utilize him as a weapon in the offense making him a great sleeper for Week 14, the playoffs, and of course next year for those of you in keeper formats. Analysis: With new quarterback Matt McGloin under center, the Raiders offense and wide receivers have become a bit more productive for fantasy owners over the past few weeks. Rod Streater has had a few solid games in a row, especially in PPR leagues, where he has seen a handful of targets and receptions each week. Three weeks ago, Streater piled up 6 catches for 84 yards and a touchdown on 8 targets. Two weeks ago he had 5 catches on 9 targets for 93 yards, and this past week he followed that up with 3 catches for 57 yards. Denarius Moore has been injured and inactive for the past 2 weeks, so Andre Holmes has also seen more playing time recently and had a great game this past week against the Dallas Cowboys. Holmes racked up an impressive 7 catches for 136 yards, on 11 targets, good for 20.60 points in PPR leagues. Both Streater and Holmes are waiver wire sleepers to be considered for Week 14 and the playoff run, especially in PPR leagues. McGloin has been a nice surprise for the Raiders offense and their WRs, who all get to face a leaky Jets secondary in Week 14. Analysis: Green is a talented young rookie tight end for the Chargers, who will eventually replace the legendary Antonio Gates at the position. Green is a big, strong, athletic TE - one to be utilized as a "move" tight, instead of focusing on blocking. This is the type of player that can quickly and easily emerge in a potent offense with a quality quarterback, similar to Jordan Reed's rise to fantasy relevancy in 2013. Green has already started producing for fantasy owners, and has racked up at least 12 points in PPR leagues each of the past 3 weeks. Green is a legit waiver wire sleeper, and even though his targets and receptions are a bit inconsistent, he has the upside to produce for fantasy owners. If you're in a tough spot at tight end for the fantasy playoffs, or are in a deep league where you're looking to stash a sleeper with upside, then target Green off the waiver wire in Week 14. Analysis: Unfortunately Le'Veon Bell, the lead running back for the Pittsburgh Steelers, sustained a nasty hit on Thanksgiving and suffered a concussion. There haven't been too many updates on the medical situation yet, but based on the severity of the hit from a visual perspective, it certainly seems possible that Bell may not be cleared to play in Week 14. Dwyer has been functioning as the primary backup RB for the Steelers, so if Bell were to miss anytime Dwyer would most likely see a majority of the early down work. While we wouldn't expect Dwyer to have any spectacular games or win any championships single-highhandedly, he could emerge into a decent FLEX play if given the opportunity to start at RB for the Steelers. If you're a Bell owner, or just looking for a deep RB sleeper for the playoffs, then target Dwyer off the Week 14 waiver wire. Analysis: The New York Jets offense and Geno Smith have been horrible the past few weeks, becoming a goldmine for fantasy owners who are picking-up defenses on a weekly basis. This past week they only scored 3 points, gave up 4 sacks, 2 interceptions, and a fumble, good for 17.00 points in some scoring formats. In Week 12, the Jets gave up 16 fantasy points to the Ravens, and in Week 11 they allowed 19.00 points to the Bills. Make sure to add the Oakland Raiders defense this week, as they are the next team that get to shutdown the Jets offense and rack up points for fantasy owners. This Oakland Defense snippet was also featured on FantasyPros.com's waiver wire article for Week 14. Have you already been eliminated from your fantasy football leagues? Fear not, you can still draft new lineups and compete against as many opponents as you please every week on Fanduel. Register for Fanduel through RotoBaller and receive a free 100% bonus on your deposit. If you deposit $150, Fanduel will give you another $150 for free. RotoBaller also offers exclusive lineup picks for Fanduel, so you can read our expert analysis and win your leagues. Good luck RotoBallers in Week 14 and the playoffs!